In time, the microscope made the existence of a whole tiny world irrefutable. This amazing device was invented in the 1590s, probably either by Hans Janssen, working with his son, Zachariah, or by Hans Lippershey, all of whom were eyeglass makers in Middelburg, the Netherlands. 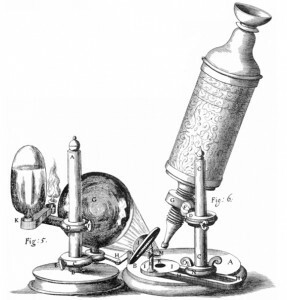 The microscope was possibly a byproduct of the invention of the telescope, and it definitely benefited from the fact that a great many people were wearing eyeglasses by the end of the 16th century. The compound microscope, multiple lenses in a tube, like the device Robert Hooke used to make his famous study of cells, was invented before the simple, single-lens model like the one Anton van Leeuwenhoek used when he discovered microorganisms. Richard Zsigmondy won in Chemistry in 1925 for his development in 1903 of the ultramicroscope, which allowed him to view objects that were below the wavelength of light. Frits Zernike won in 1953 for his invention in 1932 of the phase-contrast microscope, which makes colorless or transparent objects visible. Ernst Ruska won in 1986 for the electron microscope, a superior design for magnification that he developed in 1938. Gerd Binnig and Heinrich Rohrer won in 1986 for inventing the scanning tunneling microscope in 1981. This amazing instrument makes the atoms in an object visible — in three dimensions!